There are several lakes within close proximity including: Black Canyon, Woods Canyon, Willow Springs, Bear Canyon, Chevelon, Knoll, and Blue Ridge Reservoir. There are many other summer and winter recreational opportunities nearby including hiking, backpacking, horseback riding, camping, biking, snowshoeing, sledding and cross-country skiing. Arizona native, grew up in northern AZ and have lived in Phoenix since early 90's. Love the outdoors as you can see by how the cabin is designed. 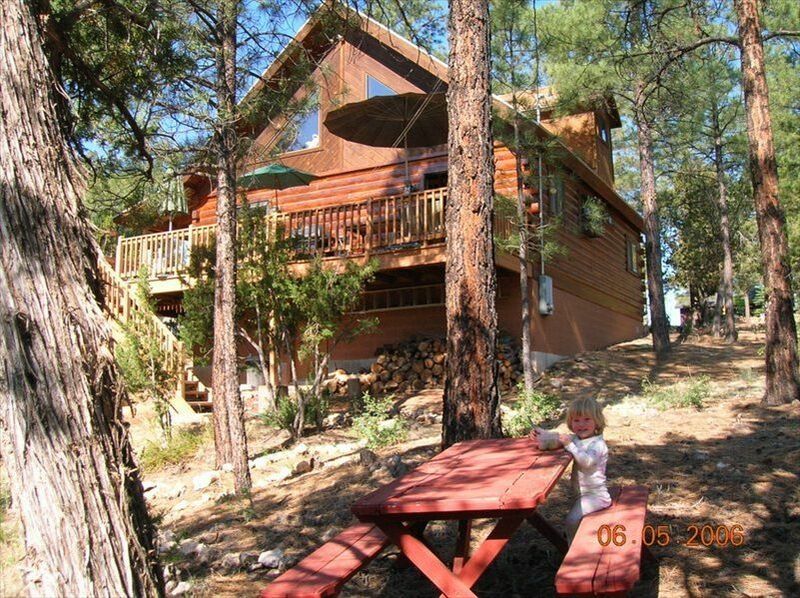 Great get-a-way from city life, mountain cabin retreat, put away the electronics and visit, take a walk in tall pines breathing fresh mountain air, play games, watch a movie… Just RELAX !! Cabin sits on two lots at a dead end street, private and peaceful. DVD and VCR collection. There are two video stores in town (5-10 min drive). The cabin was perfect, very pretty property. The kids had a great time sledding down the little hill behind the cabin. We enjoyed the great location. I loved everything about the cabin. Very disappointed!! Never had such a bad experience. The cabin was cold, he did say the rooms have electric heaters but they where all over the cabin. The smell when you walk inside was so stuffy & heavy per odor. The overall cabin was not very clean,the shower had used soap bars & shampoo,which would be better not to have any at all because I like to bring my own. The couch & chairs where pretty dirty, not something comfortable for me or my kids to sit on. I was in the cabin for a little over an hour, my allergies got really bad so we packed up & left. I contacted the owner by phone & email on Wednesday 11/21 & still haven't gotten a response from him & it's 11/25,. So it was not a good experience & not how I planned on celebrating my Thanksgiving!! If you rent the cabin & having to pay all the service & cleaning fees I think it should be a little more presentable!! Definitely not going to use this cabin again!! My family needed a recharge weekend and it was great! We loved cabin and area! The cabin was very clean and comfortable. We will definitely be back. The property was clean and just what we were looking for. The weather was gorgeous! I have stayed in several different cabins in Heber including this one and this is the one I enjoyed the most due to location and amenities. This trip I noticed that the kitchen could use a little more TLC along with the linens. Cookware and utensils along with linens could stand to be updated. Overall had a fantastic time!! Good feedback and thank you. We have taken your inputs and gone thru the linens and other items to remove outdated and worn items, replacing them with new. Glad you enjoyed your stay and look forward to you visiting again to enjoy the fresh updates and lovely weather and location. Take care, see you again! What a beautiful cabin! My girlfriend and I stayed for 3 days and the place was charming and well equipped. The location was great also, with the Red Onion within walking distance!